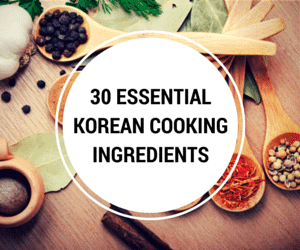 Let’s make some sweet Korean snacks, Korean walnut pastry – Hodugwaja! 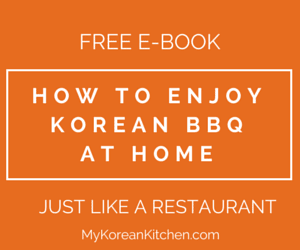 Do you know hogugwaja / hodo kwaja (호두과자)? 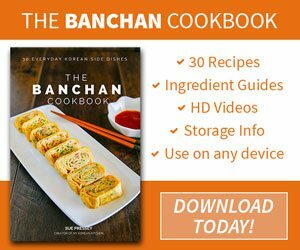 It’s a popular Korean street snack! But you can also easily see it at a highway rest stop in Korea. It used to be my family’s go to snack while we are travelling around the country. I would describe it as walnut shaped pastry but some people also call it Korean walnut cake or Korean walnut cookie. 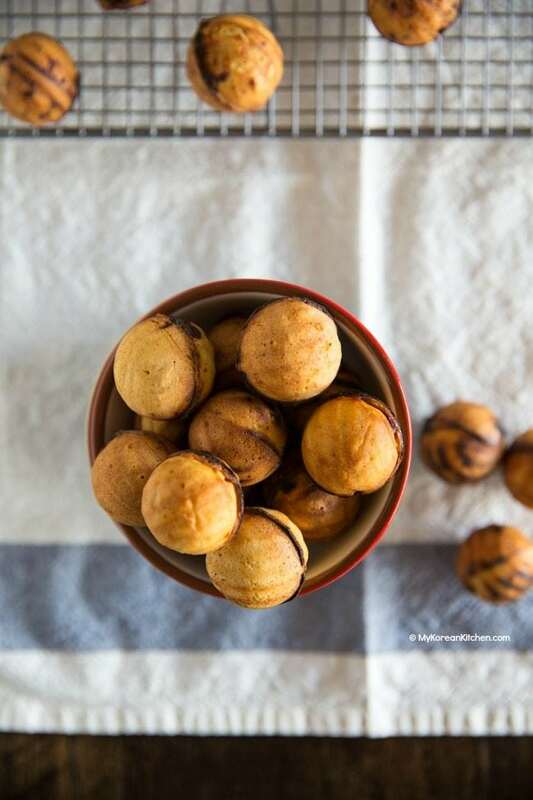 Commonly, Korean walnut pastry is filled with sweetened red bean paste and small chunky walnuts, but you might also see sweetened mung bean paste filling too. 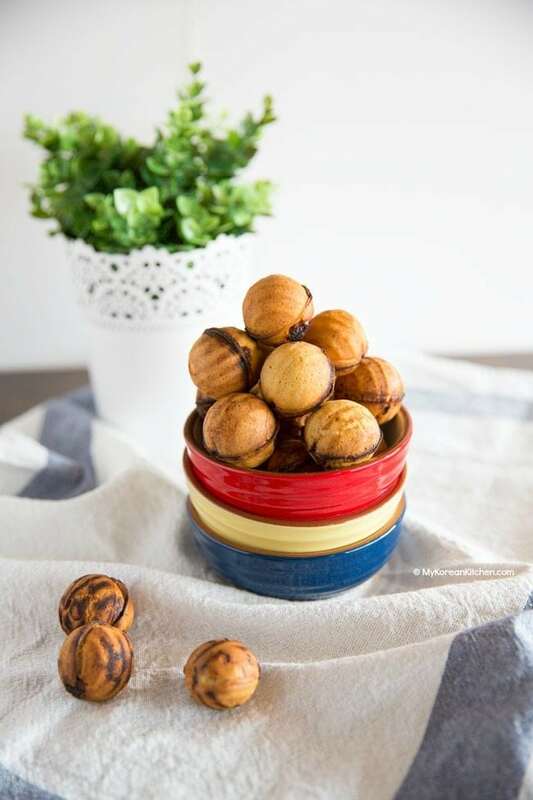 The taste of Korean walnut pastry is quite similar to Korean fish shaped pastry – bunggeoppang (붕어빵), but obviously walnut pastry includes real walnuts in it, so it tastes more nuttier. So, to develop my walnut pastry recipe, I started off by modifying my fish shaped pastry recipe. And, I found that the batter was too thick for the small holes of walnut pastry mold. So I increased the liquid to balance it out from my second trial onwards. While it’s most common to make Korean walnut pastry with plain flour / all purpose flour, I really loved the result when I used cake flour. Because it gave a really nice crispy outer layer, so it was like having a cookie / biscuit. 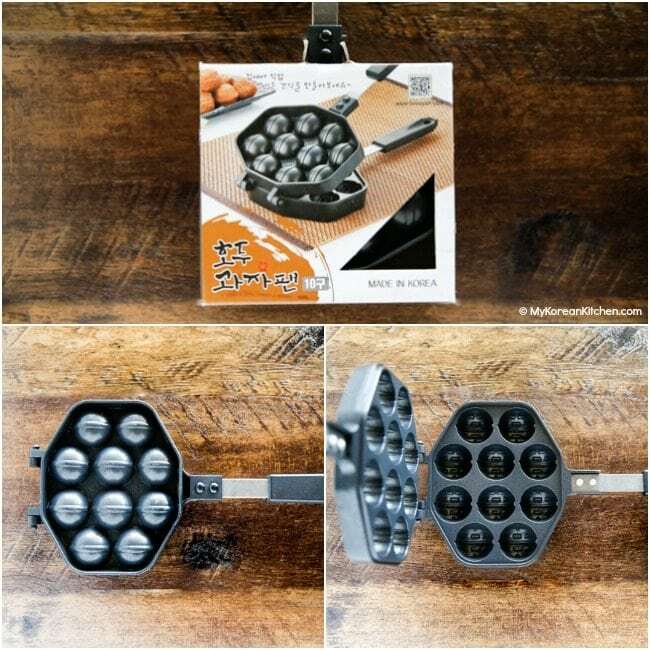 In case you’re wondering, below is the picture of the walnut pastry mold / walnut cake pan I used for this recipe. 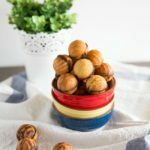 Korean walnut pastry is quite easy to make, though, you might need to bring your hand coordination skills as you bake them. Another thing I want to point out is, it makes a great gift! It presents so nicely and cutely. Apparently it’s gaining popularity as a wedding reception favor in Korea! Anyway, hope you give this a try soon. It will make a great kids holiday project too! 1. 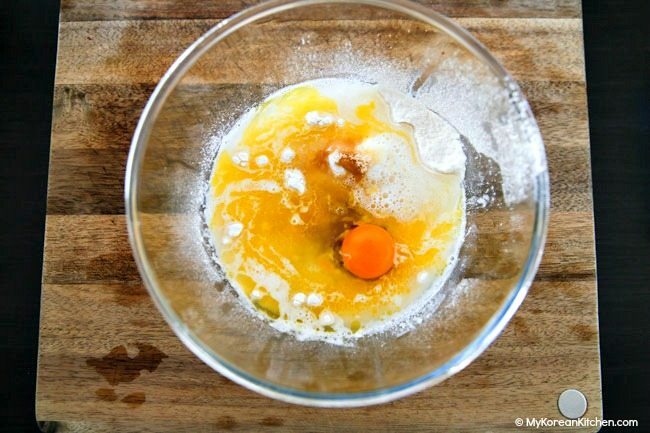 Combine all batter ingredients in a medium sized bowl. Mix them well. Transfer the mixture into a jug that has a spout for easy pouring. 2. Preheat a walnut cake pan over low heat. Quickly brush both sides of the pan with some melted butter or cooking oil. 3. Pour the batter mixture onto the walnut cake pan. Only cover about 60 % of the pan. Add the red bean paste and walnuts then add more batter mixture on top to cover the walnut cake mold. Make sure you don’t pour it too excessively as it can run down to the burner. (It will burn and smells. Also, it’s a cleaning hassle). Close the pan and turn it over quickly. Turn up the heat to medium low. 4. Cook both sides of the pan until the walnut pastry turns golden brown (about 4 mins each side). Make sure you check the doneness of the cake fairly often to avoid burnt pastry. Remove the pastry from the pan and cool down on a rack briefly. You many need to trim the edges of each walnut pastry with scissors to pretty them up. 5. Repeat the steps 2 to 4 until you use up the ingredients. Serve while still warm. Tastes best within 24 hours. Traditionally, sweetened red bean paste is the common filling used. But you can also make it with nutella or other spread. If the filling is quite runny, I suggest you use a piping bag to squeeze it out to make the cooking process smooth. Combine all batter ingredients in a medium sized bowl. Mix them well. Transfer the mixture into a jug that has a spout for easy pouring. Preheat a walnut cake pan over low heat. Quickly brush both sides of the pan with some melted butter or cooking oil. Pour the batter mixture onto the walnut cake pan. Only cover about 60 % of the pan. Add the red bean paste and walnuts then add more batter mixture on top to cover the walnut cake mold. Make sure you don’t pour it too excessively as it can run down to the burner. (It will burn and smells. Also, it’s a cleaning hassle). Close the pan and turn it over quickly. Turn up the heat to medium low. Cook both sides of the pan until the walnut pastry turns golden brown (about 4 mins each side). Make sure you check the doneness of the cake fairly often to avoid burnt pastry. Remove the pastry from the pan and cool down on a rack briefly. You many need to trim the edges of each walnut pastry with scissors to pretty them up. Repeat the steps 2 to 4 until you use up the ingredients. Serve while still warm. Tastes best within 24 hours. I’ve never used a cake pop maker, so I wouldn’t know. You can try it at your own risk. 🙂 Let us know how you go. No, it’s different – the batter might be made in a similar way but certainly the filling is different. 🙂 I’ll add that to my do list. Thanks for your suggestion. 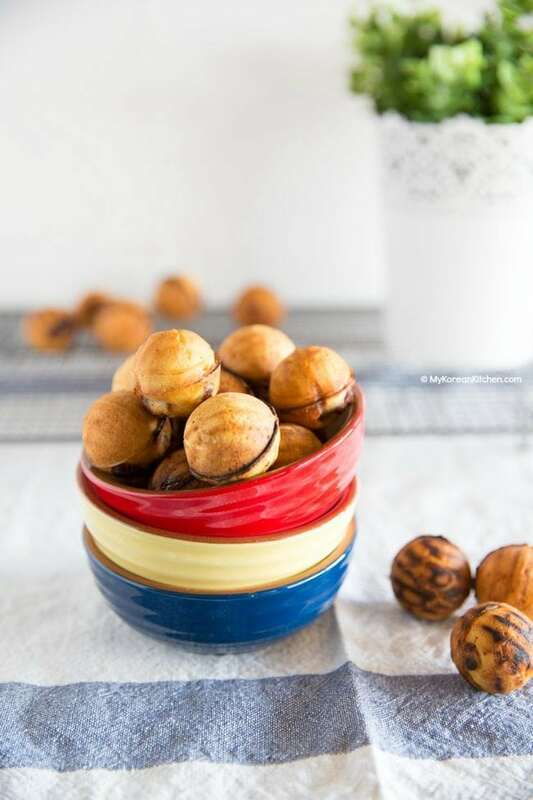 This walnut pastry looks so simple and awesome, and too pretty to eat! Thanks for sharing!! Travelling around tje south I’ve noticed many different areas say their walnut pastries are the best and often the original !! My wife makes a red bean drink. Cooked red bean blended with sugar , nice evening drink hot or cold. Haven’t tried making the walnut pastries. Isn’t that funny?! 🙂 I haven’t tried red bean drink, only the red bean porridge, but it sounds interesting! 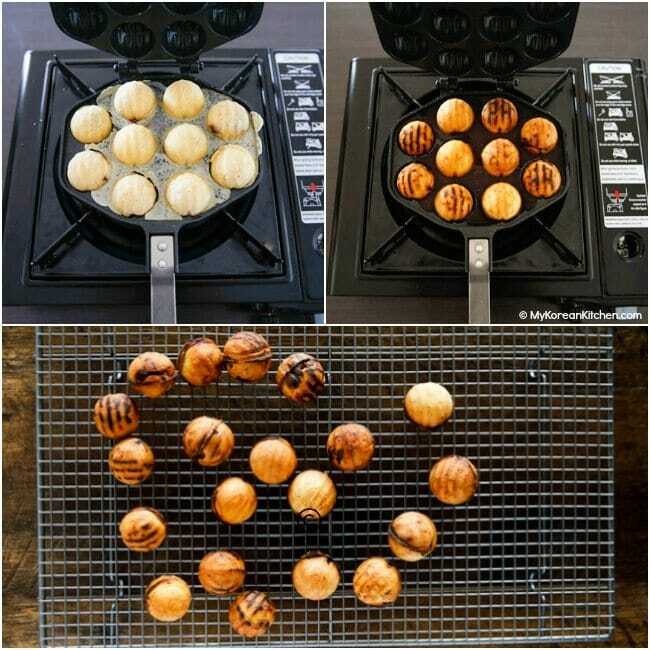 Can this be made like takoyaki? 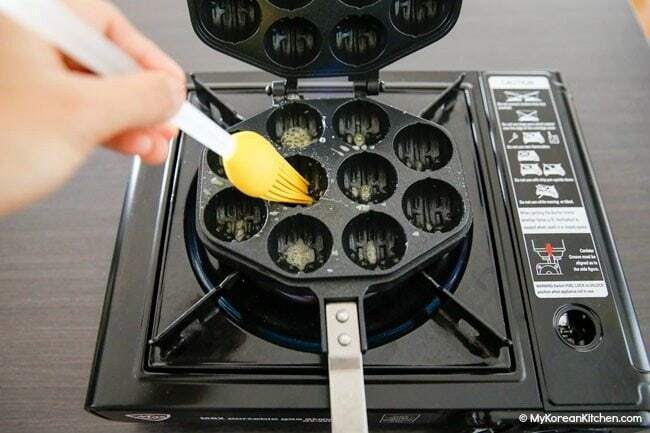 I have at takoyaki hotplate. This looks really delicious. 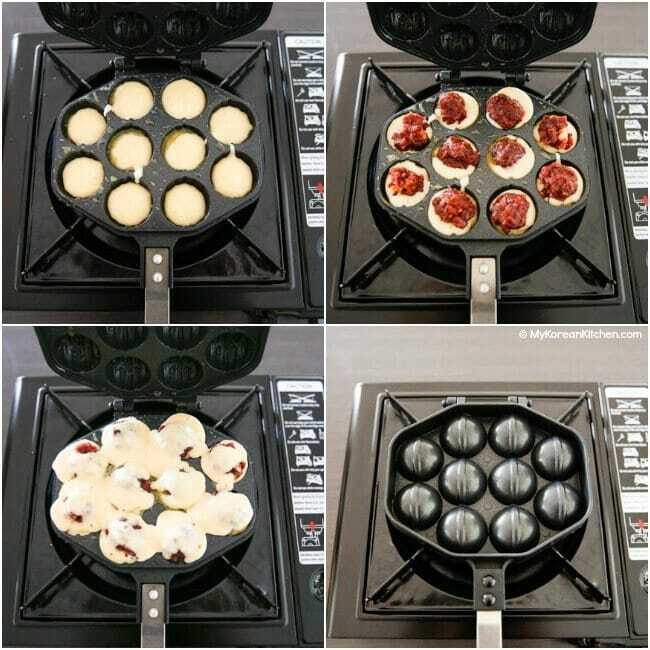 Hi Lee, does your takoyaki pan has a lid to cover & flip so that you can cook the other side easily? (I don’t think takoyaki is made like that.) Regardless, if you’re very skilled at making round shaped balls without the lid, I suppose it can work. 🙂 Let us know how you go.